1 "Bobo" is what Spanish settlers called this tropical seabird. In Spanish, the name means "stupid fellow." Which bird has such an unflattering name? Well, the blue-footed booby is the unfortunate one! 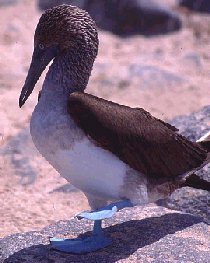 While most birds fly away as soon as they detect danger, blue-footed boobies do not. Their lack of fear makes them an easy catch and is how they got their Spanish name.